Anthropologists who consider the nose an important racial index (Topinard, Bertillon, Deniker, and others) in their classifications of varieties of noses have one class which they call "Jewish," or "Semitic"—prominent, arched, and "hooked" noses. It has been pointed out that this Semitic nose appears in ancient Egyptian monuments, in figures representing Semites. On the other hand, some authors show that this form of nose is not characteristically Semitic, because the modern non-Jewish Semites, particularly such as are supposed to have maintained themselves in a pure state, as the Bedouin Arabs, do not possess this characteristic nose at all. Their noses are as a rule short, straight, and often "snub," or concave. Luschan holds that the hook-nose is by no means characteristic of the Semites, and contends that the small number of arched noses that are found among the Jews is due to ancient intermixture with the Hittites in Asia Minor. He shows that other races also, as the Armenian, for instance, who have a good portion of Hittite blood in their veins, have hook-noses. Galicia 60.1 28.4 4.9 6.6 842 Majer and Kopernicki. Russia 84.0 2.0 10.0 4.0 100 Blechman. Lithuania 55.0 21.7 18.8 4.3 69 Talko-Hryncewicz. Galicia 84.0 4.0 8.0 4.0 25 Kopernicki. Little Russia 70.9 18.9 6.4 3.4 206 Talko-Hryncewicz. From these figures it can be seen that the majority of noses in Jews are straight, or what is popularly known as "Greek." Over 60 per cent of the noses of Jews in the table above are of this variety, in some groups exceeding even 80 per cent. "Jewish" or arched noses are in the minority, less than 25 per cent being of this kind; in Poland, Elkind found only 6.5 per cent of Semitic noses among the Jews in Warsaw; Weissenberg, in South Russia, only 10 per cent; Yakowenko, in Lithuania, 9.79 per cent. The proportion of "snub" noses—from 3 to 6 per cent—is of interest. 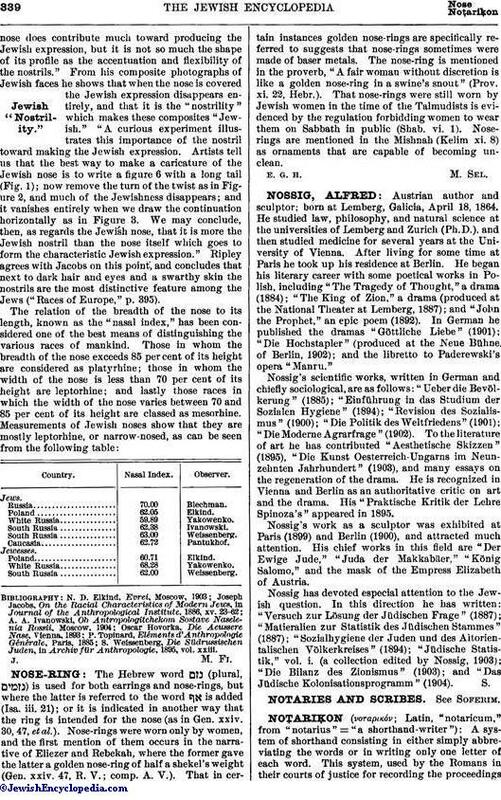 A comparison of the statistics of noses in Jews and non-Jews in Russia and Galicia shows that the percentage of straight noses is about the same in both; aquiline and hook-noses are somewhat more frequently met with among the Jews, while "snub" noses are oftener encountered on non-Jewish faces. 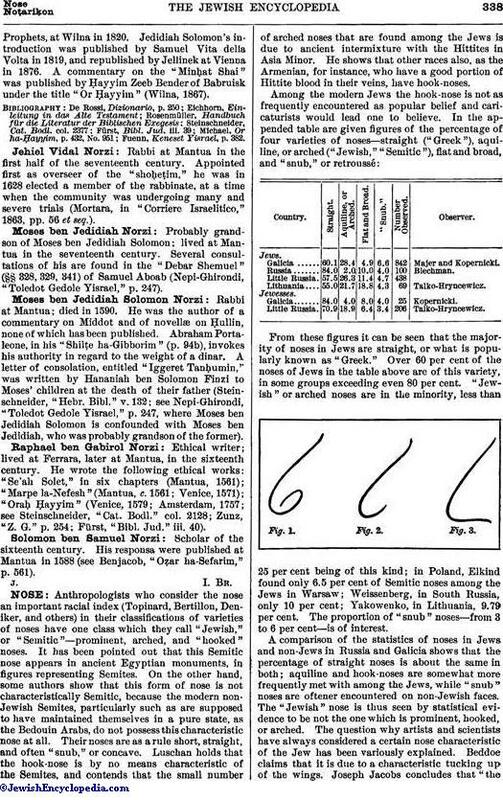 The "Jewish" nose is thus seen by statistical evidence to be not the one which is prominent, hooked, or arched. The question why artists and scientists have always considered a certain nose characteristic of the Jew has been variously explained. Beddoe claims that it is due to a characteristic tucking up of the wings. Joseph Jacobs concludes that "thenose does contribute much toward producing the Jewish expression, but it is not so much the shape of its profile as the accentuation and flexibility of the nostrils." From his composite photographs of Jewish faces he shows that when the nose is covered the Jewish expression disappears entirely, and that it is the "nostrility" which makes these composites "Jewish." "A curious experiment illustrates this importance of the nostril toward making the Jewish expression. 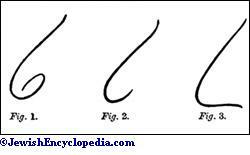 Artists tell us that the best way to make a caricature of the Jewish nose is to write a figure 6 with a long tail (Fig. 1); now remove the turn of the twist as in Figure 2, and much of the Jewishness disappears; and it vanishes entirely when we draw the continuation horizontally as in Figure 3. We may conclude, then, as regards the Jewish nose, that it is more the Jewish nostril than the nose itself which goes to form the characteristic Jewish expression." Ripley agrees with Jacobs on this point, and concludes that next to dark hair and eyes and a swarthy skin the nostrils are the most distinctive feature among the Jews ("Races of Europe," p. 395). S. Weissenberg, Die Südrussischen Juden, in Archiv für Anthropologie, 1895, vol. xxiii.